Each group should elect a spokesperson to share the most pressing problems you are facing. It’s probably a long list, so pick the most troublesome things that you can’t resolve. The group will be eager to hear what’s happening in your jurisdiction concerning battles at the bargaining table at contract time, the mounting tension between the police and communities you serve, strategies and tactics used to counteract the negative coverage of law enforcement, the struggle to get input into policies related to body cameras, relations with the media, increase of attacks on the police, saving your members’ pensions, and whatever other issues are piling up on your platter. Elaine Bernard is widely regarded as one of the world’s leading experts in the history of unions and the valuable role they play in curbing income inequality and building a vibrant, financially secure middle class. She is the executive director of the Labor and Worklife Program at Harvard Law School and the Harvard Trade Union Program. The Labor and Worklife Program (LWP) is Harvard University’s forum for research and teaching on the world of work and its implications for society. Located at the Harvard Law School, the LWP brings together scholars and policy experts from a variety of disciplines to analyze critical labor issues in the law, economy, and society. The LWP also provides unique education for labor leaders throughout the world via the oldest executive training program at Harvard University, the Harvard Trade Union Program, founded in 1942. In 2015 three police union leaders attended the six-week long program and Elaine hopes to welcome more law enforcement people to the program in January 2018. 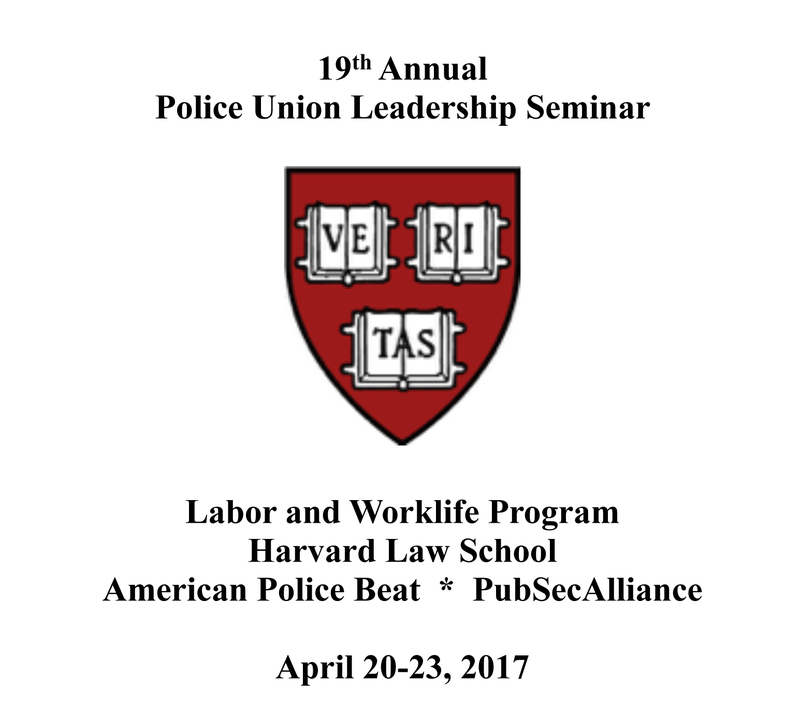 In 1999, Bernard and Harvard economist Richard Freeman organized the first Police Union Leadership Seminar at Harvard University. Since then, with the support of Cynthia Brown of American Police Beat and PubSecAlliance, Bernard and the Labor and Worklife Program have hosted the seminar and made it an annual event. Recently Bernard has organized a Leadership Development Program for Canadian police unions working with the Canadian Police Association and the University of Ottawa. There is no profession anywhere that is more conflict-ridden than law enforcement. Whether it’s conflicts with the people you have to arrest, conflicts with management, conflicts within your union, or conflicts with the citizens you serve and the world at large, people doing police work are literally overwhelmed with conflict coming from all directions. In this session, Dr. Shapiro, one of the world’s leading experts on conflict resolution, will talk about the myriad of reasons people get bogged down in endless conflicts and reveal some helpful ways to resolve the issues and move forward. Dr. Shapiro will walk you through successful ways to get out of the conflict mode and into the collaboration mode with a powerful, proven method that will work even with your worst enemy. Based on two decades of research, Dan Shapiro will discuss the five core motivational concerns that underpin effective collaboration and you will get concrete advice for using them in a practical setting. Examples will be drawn from his experiences working with everyone from clashing corporate executives, hostage negotiators, international enemies and families in crisis. Questions and discussion encouraged. Daniel Shapiro, Ph.D., is founder and director of the Harvard International Negotiation Program, associate professor in psychology at Harvard Medical School/McLean Hospital, and affiliate faculty at the Program on Negotiation at Harvard Law School. He consults regularly for government leaders and Fortune 500 companies, and has worked with everyone from hostage negotiators and families in crisis, to disputing CEOs and clashing heads of state. Are you sharing the news when your members do great work? Is your message getting through to others or are you talking to yourself? Are you using images and video every time you post on your website or send out an email? What you say, how you say it, and what communications media you use makes all the difference. Mike Parker will give you helpful tools for what you should and shouldn’t do through real life examples of failures and successes using social media, websites, and media outreach from across the nation. Please feel free to share your successes and failures with the class. Mike Parker is a 31-year veteran of the Los Angeles County Sheriff’s Department (LASD),and has worked at 15 patrol, jail, and administrative assignments since he graduated from the Sheriff’s Academy. His most recent assignment was commander of the Personnel and Training Command of the LASD, which includes over 9,500 deputies and 7,500 professional staff. Mike has presented at over 50 major policing conferences in over 30 countries and has published over 100 articles on communications, community policing and problem solving. In 2012 Mike received the FEMA “Community Preparedness Heroes Award,” and in 2013 received the White House “Champions of Change” Award. He is considered one of the leading experts in how law enforcement agencies and associations can implement a communications and public relations effort with an emphasis on social media. In this session, Will Aitchison, one of the nation’s most influential attorneys representing law enforcement unions and associations, will review important legal developments over the last year, including case law concerning body cameras, the Garrity rule, Brady lists, the FLSA, and other important topics. Will also review the wage and benefit settlements among the country’s largest police departments. Will Aitchison is a Portland, Oregon attorney who has represented over 100 law enforcement and firefighter labor organizations. He is a veteran of hundreds of public sector labor negotiations and has handled dozens of FLSA lawsuits for law enforcement officers, recovering over $100 million in damages. Mr. Aitchison received his law degree from Georgetown University and is the author of eight books on public sector labor matters, including The Rights of Law Enforcement Officers (6th Edition), The Fair Labor Standards Act (5th Edition), and Collective Bargaining. Will also acts as a negotiations consultant for law enforcement labor organizations. Shelby Chodos, a public finance expert at Harvard’s Kennedy School – and, according to your evaluations, one of the most popular presenters ever at the Harvard Police Union Leadership Seminar – is back this year to discuss the facts as opposed to myths about public sector finance so you will be better informed about this important issue. He will talk about where state and local governments spend their money as well as the ongoing fiscal and pension crises caused by legislatures’ refusal to raise taxes. You will learn that it’s not your pay, health care benefits and pensions that are the problem – the costs of which have stayed relatively stable over many years. He will present the facts that show the real problem is the astronomical increase in health care expenditures combined with lower tax revenues that’s become unsustainable. He will discuss the information you have to have about public finance and the things you need to understand before you head to the bargaining table. Special attention will be paid to understanding how your city’s bond ratings are determined and how to get the data on your city’s expenditures which will show that in most municipalities spending on public pensions averages below 3% of total expenditures. Shelby Chodos has taught the graduate level state and local finance courses at Harvard for more than a decade and a retired managing director of Commonwealth Capital Partners, Inc., a private investment firm in New England. After receiving his Master’s degree from Harvard University’s Kennedy School, he spent a decade on Wall Street, where he worked for a major investment banking firm. He has served as an expert witness before numerous legislative and administrative bodies on finance, economic development and pension investment. He received his Masters from Harvard’s Kennedy School in 1982 on a full academic scholarship as the recipient of the Truman Scholarship Program, established by Congress in honor of the Nation’s 33rd President. How close to retirement or some other form of departure are the people in the critical positions in your organization? Is the War on Police Over Under President Trump? A majority of law enforcement officers and their unions are convinced there is a war on cops that was instigated by President Obama. The National FOP and scores of local police unions endorsed Donald Trump while not one police union in the country endorsed or campaigned for Hillary Clinton. Some of the criticisms about the lack of public support of police by President Obama and Secretary Clinton were justified. Candidate Trump clearly courted police unions and publicly praised the difficult work law enforcement people do. In a profession under daily attack after each video of police use of force goes viral, it was a relief that that we might have elected a president who promised not to unjustly pre-judge the actions of officers. All the signs indicate that the Trump administration will show greater general support for law enforcement; provide more funding for immigration enforcement; and ramp up the fight against radical Islamic terrorists. But what about the real issues confronting police officers and police unions? Are they going to be addressed? Don’t count on it. In this class Ron DeLord will discuss conflicts that arise when the president and both houses of Congress are pro-business. These people are historically anti-union, anti-defined benefit pensions, anti-public employee dues deduction, anti-collective bargaining, and certainly not your friend on labor issues. The next Supreme Court justices will be aligned with the Chamber of Commerce, Koch brothers, Laura and John Arnold, Reason Foundation and Goldwater Institute. Urban police officers will still have to deal with racial divides in minority communities, unemployment, poverty, the mentally ill, homeless people, understaffing, and a lack of funding for training and equipment. And many police unions are facing new reduced benefit pension tiers as local and state governments dismantle defined benefit pensions in every state. These cities also have to deal with the financial challenges of eroding infrastructure. Ron will trace how the proposed cuts in funding for a wide range of social services means more and increasingly dangerous work for the police. So what should we do? First, don’t fall into the trap of believing all is well in the world and it’s time to relax. President Trump may be your friend on some levels, but he cannot and will not erase your challenges. But you can adapt to the new reality and embrace reforms that will improve the profession. Having a clear communications strategy is a vital component of any police union/association strategic plan, but that strategy can often get tossed out the window in the aftermath of a critical incident where your members are in the media crosshairs. This session will build on last year’s presentation, offering more practical and hands-on tips you and your association can use to respond in circumstances where standard ‘command and control’ just isn’t possible. From identifying potential crises that your organization may have to prepare for, to the sharing of ‘best practices’ and advice from a former press secretary to a national politician with over 10 years of relationships developed with media, and who now works exclusively on behalf of front-line police personnel. Michael will also review some “hits and misses” from press conferences. Michael Gendron began a 10 year career working on Parliament Hill (Canada’s equivalent of Capitol Hill) in 2001 and served in a variety of communication and policy roles for the Minister of Transport, Minister of Social Development and the National Caucus Research Bureau before taking on a role as a Press Secretary with the Leader of the Official Opposition (Minority Leader) in 2007. During this hour, Elaine will talk about the crucial historical role unions have played in lessening income inequality and promoting democratic values. Elaine will report on the latest well financed efforts to destroy both public and private sector unions that is posing a serious threat to your pay, your pension and health care programs, and even your job. Participants are encouraged to share their experiences and ideas of how best to protect the hard-won pay, benefits and improved working conditions for your members. Founded in 1993, TASER International has remained committed to protecting truth and protecting life with innovative public safety technologies. Our TASER devices and Axon platform have transformed how members of law enforcement do their jobs. Our Axon platform offers agencies an end-to-end solution for managing digital evidence that connects mobile, cloud, and wearable technologies. Agencies have relied on us for the latest in law enforcement technology because they know that solutions like Axon’s Evidence.com will make their lives easier and more efficient. To date, more than 158,000 lives and countless dollars have been saved with TASER’s products and services. Ferguson, Dallas, Baton Rouge, the list goes on and on. For law enforcement unions and associations the past two years have been marked by one terrible crisis after another including a rash of tragic shooting deaths of officers responding to incidents, sitting in their cruisers, and even entering and exiting police headquarters. The deterioration of the relationship between the police and the communities they serve has been another big problem impacting many cities and towns across the U.S. and Canada. And the effort to eliminate defined benefit pensions, charge more for health insurance, and privatize the job is also taking an ugly toll. The effort many police unions are making to protect their members and heal the rifts with the community are truly impressive. In this session John Rivera, president of the Dade County PBA with more than 6,500 members, will talk about some of the initiatives his team has launched including hosting a weekly radio call in show, getting a Grammy award winning singer to produce a song that supports the police, organizing an aggressive political action campaign against the media and politicians, fighting the privatization effort, and even buying and serving pizzas to a crowd of Black Lives Matter demonstrators outside the PBA offices. John will fill us in on what worked and what didn’t and give some helpful hints on how you can mount similar campaigns in your jurisdiction. John Rivera is president of the Dade County Police Benevolent Association and the Florida Police Benevolent Association, and in the law enforcement union world one of the shrewdest political operatives out there. He knows who his friends are, stays focused, understands the game – when to negotiate and when to drop the bomb. He has been a relentless crusader against the effort in Florida to privatize every aspect of the public sector – from schools, to prisons, to law enforcement. Group discussion on the 2017 seminar. What topics worked, what didn’t. Please bring your thoughts and ideas about ways to change the program and make it more effective. 12:00 – 12:30 pm: Presentation of Harvard certificates.